Sting.com > News > Worn Free Coupon Offer For Vintage Sting T-Shirts! 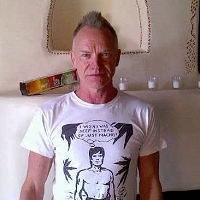 Worn Free is a vintage rock and roll T-shirt company with a simple mission: to resurrect the coolest designs by reproducing original t-shirts worn by musicians, now including Sting! The tag inside each of the 4 shirts available resembles a backstage pass and features a photo of Sting wearing the original shirt, plus information documenting the date and venue. Worn Free is now offering 20% off the total purchase by entering coupon code STING20. Pick up your shirt now at www.wornfree.com/artist/sting.html.